There are many things that make NYC what it is: a place like no other. Some of them, like Times Square, are very obvious and it’ll be on your face on your first day here. Others, you’ll find with time, and you’ll probably stumble upon them and don’t know how you didn’t see it before. Talent does not ensure success; each triumph has to be earned. I am sure you all know why this line is so powerful… Even if you train for months, you still have to go and get it. Even though we do this all the time, it is still hard. Every time. Your heart really has to be in it. 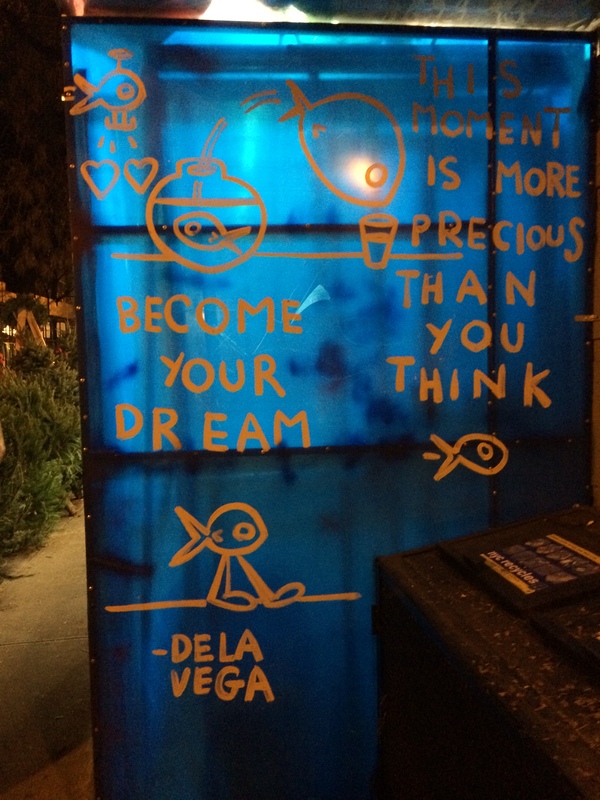 I had seen this before and knew about the artist who created the movement: James De La Vega does murals and chalk drawings in the NYC streets with aphoristic messages. But coming accross it all the time, mostly if you live in the Upper East Side is a different thing. You just walk into these things on the street ALL THE TIME. It’s fantastic. One tiny little NYC moment that will last the whole day, which is a big deal here. And yes, we’ll have to earn it. Each one of them. If we look past the common, we’re constantly being inspired by the city to wake up, all the time. And to earn each one of those triumphs. So true that talent does not equal success — hard work plays a tremendous role! No one picks up a violin and plays like a master, despite talent. I miss you!!! You are your dream! thanks sus! miss you too!